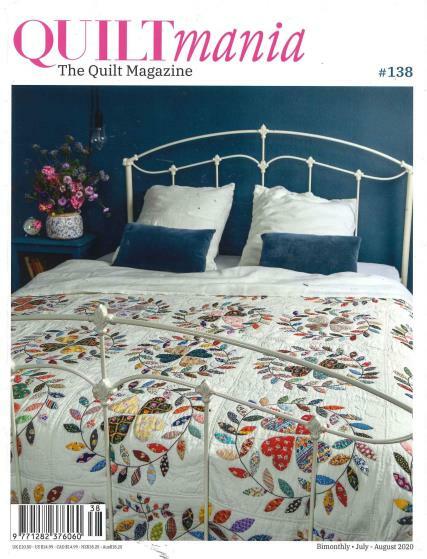 Everything is coming up quilts in the European magazine Quilt Mania. The bimonthly magazine is available in French and English. In Quilt Mania you will find quilt patterns and ideas to inspire you no matter if you are looking for traditional patterns or a more contemporary look in quilt designs. The staff of Quilt Mania understands that making a handmade quilt takes patience and skill that provides the quilter with sense of accomplishment and pride when the project is complete. Get to know fellow quilters like Yvonne Wells profiled in the magazine who puts her soul into her pictorial quilts that are mini masterpieces of art. Learn what’s going on in quilting in Europe and get a look at extraordinary antique quilts with the inside track at conferences like the European Patchwork Meeting held recently in Alsace, France. Be touched by the joy in Japanese children’s faces as they are given gifts of new handmade quilts donated from all over the world as they recover from the double disaster of earthquake and tsunami. Find quilt patterns for every holiday. Enjoy the photographs of quilts in displayed in home settings as they motivate you to get quilting. Find ideas for making gift items using quilting techniques such as jewelry boxes, handbags, seat covers, small pictures, placemats, tea caddies and Christmas ornaments. Quilt Mania is an amazing French quilting magazine with lots of wonderful photo's - great not just for new quilt designs but also for inspiration too. The only problem is that it is hard to get hold of. very inspirational magazine. Thank you. I enjoyed this magazine. The content is different to that in most English magazines. Great magazine with lots of choice for projects. i get this magazine for my mum as a present on mothers day and christmas. It makes a perfect present for a mum who loves quilting, the quilts people make are amazing! Bi-monthly issue is excellent. Specials are not so good.